Source: Review copy from WHSmith as part of their Christmas Campaign. Someday, they will tell her, things will be better. But for a small genius with big troubles, someday can't come soon enough. Angeline could read before she was old enough to turn the pages of a book, and she mastered the piano without a single lesson. But being so clever doesn't make life easy for Angeline. Mean kids at school call her a "genius freak", and her dad seems a bit worried about how to look after her. It is not until she makes friends with a boy who tells the best jokes, and a teacher who loves tropical fish, that things start to get better in some surprising ways for Angeline. This children's book has a really strong moral - that it's good to be clever and not to be ashamed of it. I think this is a good message for kids especially nowadays and I definitely recommend this book to children aged 8+. 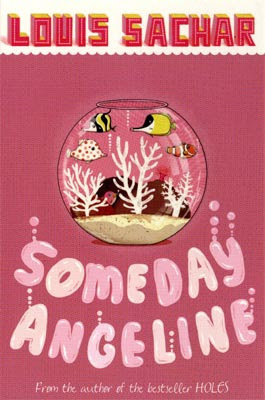 It is like a roller coaster of emotions in Someday Angeline! There's ups and downs, sad bits and funny bits. It's very true to life - especially some of the things she and her Dad say. I started to really like the characters. Angeline and her father had a really good relationship together. I had a lot of empathy for Angeline. This book is amazingly written and I think it's a story that quite a lot of kids will relate to. The cover is cool - it doesn't stand out much but it ties in with the main plot of the story. The problem is, the pink will probably put off a lot of boys. I think the story in general would appeal to boys and girls, but seeing as the cover is all pink, I don't think a boy would even give it a second glance which is a shame. Overall I give this book 4/5 and recommend it to children aged 8+.